Outfits to wear with color full socks- Wearing socks of the same boring and mainstream colors is considered kinda old-fashioned now. Come out of your comfort zone and add some colors to your wardrobe. Coordinating socks with your pants sounds a bit too common and dull. 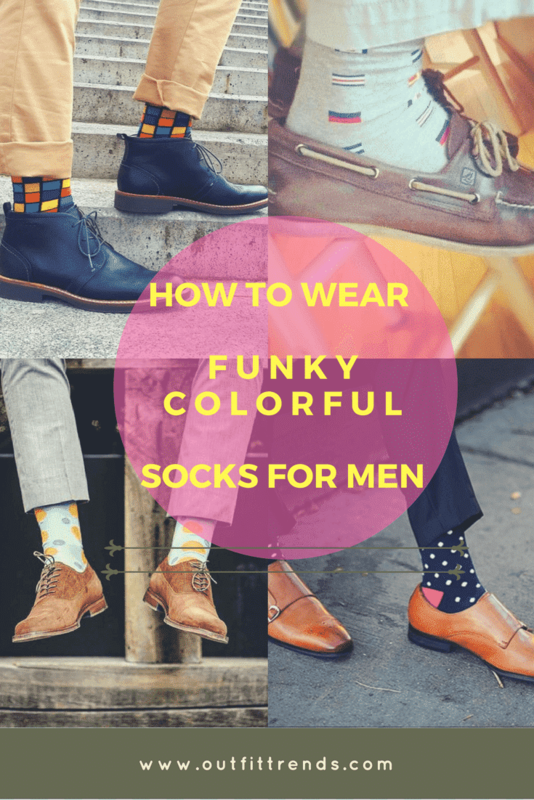 To look great and avoid the rule of thumb of matching socks with the shade of pants, you can now try some funky and bright socks which will not only make you look indifferent but will also enhance your style statement. Men can try different patterns, some crazy characters, and super cool shades when it comes to styling with socks and we’re here to help with it all. Before breaking the stereotype styles, you need to know when and how you’ll do it. The article is going to provide you with multiple styles and ensembles you can try to make your colorful socks look charming and aesthetic. You can try whatever suits your statement. Before wearing solid colored or patterned socks with a suit or tux, you need to know that you can never go for overly contrasting shades as it will make it look odd. Keep your socks colored but the overall ensemble has to look subtle. While wearing some printed socks with a charcoal or navy suit, always try to coordinate the color scheme with either the shirt, let say coordinate with the stripes on the shirt, or you can add a matching tie to your suit so that it looks aesthetically charming. You should also have a look at these 30 Amazing Men’s Suits Combinations to Get Sharp Look. 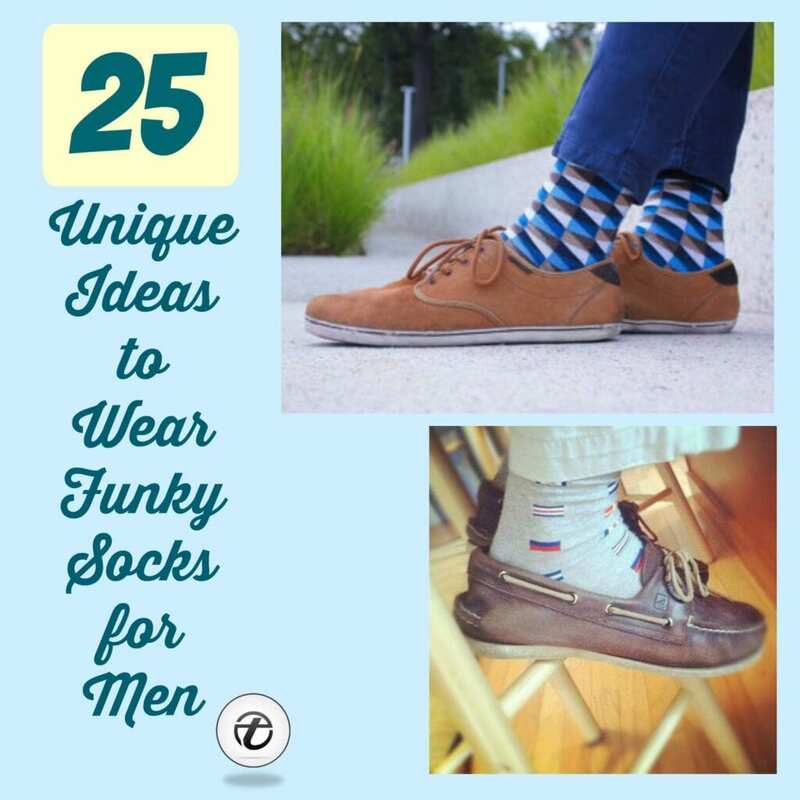 ↓24- When Not to Wear Funky Socks? There are moments when looking indifferent is considered to be the violation of decorum. You have to keep your socks simple at such times, let say a funeral or a business meeting or if your job requires you to wear a uniform. You have to show respect at times of funeral and wearing funky socks might make you look non-serious in business environments. All you need to know is when it requires you to bring the attention to your ankles. You might also be interested in these 27 Ways for Men to Wear Shoes without Socks. Solid colored bright socks look super cool when worn with a dull sweater, suit, or pants. You can go for shades of maroon, red, blue and even green. From dull, I mean lighter shades and attire which seems kind of incomplete. Also, if you’re going for sky blue pants with an off-white shirt, then dark blue socks will lift up the combo. Well, boat shoes are usually worn with denim or straight cotton pants and patterned socks will bring attention to your shoes. Try to go for socks in lighter shades when trying out patterns. Here are 15 Ways to Wear White Button Down Shirts. If you really want to try some really unique contrasts and you believe that you can totally pull it off, only then you should experiment with colors like yellow and orange. Rusty and brown clothing items go quite well with yellow or lemon colored socks. Never go for the similar shade as that of your pants when it comes to wearing colored socks, you can match it with your pocket square or inner shirt or with the pattern on your shirt. Do check out these White Jean Outfits for Men. Whenever you’re going for a funky attire as in if you’re going to a thematic party or a festival, make sure that your socks are funky as well; you can even go for novelty ones at such events because novelty socks will stand out and will go perfectly well with your chic ensemble. If you are going for a printed shirt, either a button-down or a patterned tee, always pick socks which match the print as that of your shirt as it will look super classy e.g. argyles and gingham prints can be coordinated quite well. Also, make sure that your shoes are simple and neutral color. Here are Men Road Trip Outfits. You can totally match your socks’ color with that of your t-shirt or sweatshirt. Personalize your socks on your wedding to get some amazingly bright and lively pictures. If you find your tux ‘not so lively’ and feel like adding a bit of a color to liven up the outfit, then solid colored bright socks is your ultimate option. Do check out these Casual Wedding Guest Outfits for Men. Multicolor socks or novelty socks only work in situations when you know that you’ll have to go barefoot at some point e.g. at some Japanese or Russian restaurant or meet-up. You can bring smiles on faces and create goodwill relationships. Some of the guys trying novelty socks out there are quite brave since everyone cannot pull off such bold and crazy styles. Such novelty hosiery choices work flawlessly on thematic weddings, parties or even prom. Here are 30 Best Men’s Outfit Ideas to Wear with Monk Strap Shoes. Grooms’ can synchronize their socks with that of their brides’ shoes if they are sharp colored as in sky blue, aqua green, violet or plum colors. During summers, you can totally slay a pair of funky socks with super funky shorts. Don’t miss out 20 Stylish Men’s Outfits Combinations with Shorts. When trying a pastel combo, then go for pastel socks as well to make your ensemble look synchronized. ↓10- Why not Pink Socks? If you can try pink shirts, then you can definitely pull off pink socks as well. You can wear these with perforated oxfords when your ensemble is kind of formal or plain white sneakers when wearing with denim. Have a look at 20 Shoes To Wear With Guys Sweatpants. Geometric socks are extremely charming when worn with denim pants folded at the ends. These are available in sharp contrasting shades and are most appropriate for tall guys. Polka dots are gonna be an ever going trend, whether tops or socks. Go for funky polka dot socks with off-white or grey dresses. Here are 20 Ways to Wear Blue Suits with Brown Shoes Ideas for Men. If you are going for some bright colored shoes i.e. yellow, green or orange sneakers or loafers, then contrasting socks with a hint of the color of the shoes is definitely a chic approach. Sometimes, when wearing printed socks then a little bit of the color of the pants in the socks doesn’t hurt the funky and charming look of the socks. Do check out 20 Fashionable Ways to Wear Vans Shoes. Floral socks look super classy with plain and simple outfits like black, charcoal or navy blue suits. Before directly jumping on to sharp shades, start with the classy patterns like gingham, polka dots, and stripes, in not more than dual shades. Here are 18 Ways to Wear Red Shoes for Guys. Make sure that your ankles are on display when trying to bring the attention to your socks. The length of your pants must be 1 to 1.5 inches shorter than your shoes. ↓2- What to Wear in the Beginning? Go for argyles and polka dots, with the base color of the socks be that of your pants to get yourself used to the new trend. Geometric prints go best with oxfords while novelty socks usually look good with sneakers since they have more of an informal sight. Share your unique ideas in the comments section.